There's no debating Shane Doan's commitment to the game of hockey or to his teammates. But the argument could be made that one of the sport's most character players works just as hard away from the rink. Beloved by those he plays with, respected by those he opposes, Doan, who has played all of his 14 seasons with the Winnipeg Jets/Phoenix Coyotes franchise, was an ideal choice for the 2010 King Clancy Memorial Award. Given annually to the NHL player ‘who best exemplifies leadership qualities on and off the ice and who has made a significant humanitarian contribution to his community,' Doan's King Clancy honour was indeed a fitting one. Yet for Doan, the individual recognition was achieved through a collective effort. There was plenty for Doan to be proud of in the 2009-10 season, one that many outside of Phoenix expected to be a long and difficult campaign for a team that has struggled to keep pace in the Western Conference over the past decade. While a seven-game opening-round loss to the Detroit Red Wings was a bitter way to end their year, Doan, who was injured for the majority of the playoffs, had high praise for his teammates and the organization. What was he most proud of? “I think the fact that we were challenging San Jose at the end of the year when everyone said that we'd hit a wall at some point,” offered Doan, who appeared in his NHLPA-recognized 1,000th regular season game in 2009-10. “Then at the end of the year we picked it up and were better in the last 15 to 20 games of the year. No wonder the seventh overall selection in the 1995 NHL Entry Draft is eager for the new season to get underway. 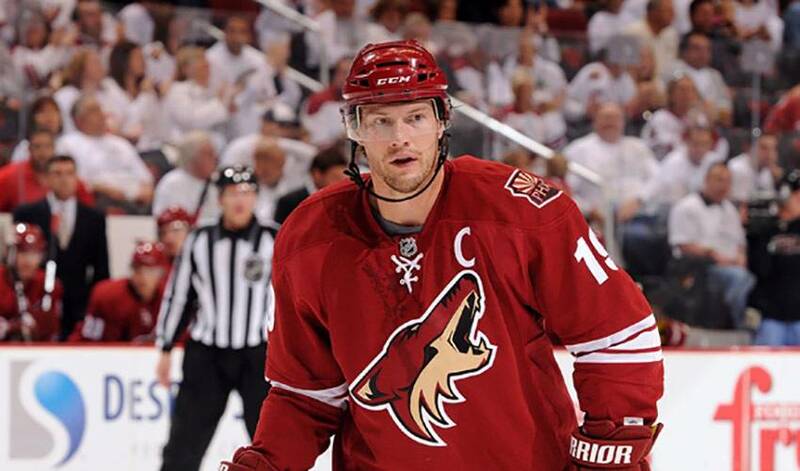 “I recognized that I don't have a lot of years left of playing at the level that I want to,” said Doan. “But the Coyotes have been phenomenal to me. The organization and the people that have been there the whole time with me, there is no way that I was leaving. It was exciting to turn it around. A return to the playoffs would hold great personal significance for one of the league's most competitive leaders. “I waited a long time to get to the playoffs and to then be sitting on the sideline watching my team play I was as frustrated as I've ever been in hockey,” Doan admitted. “But it just drives you for this coming summer, and I can't wait to start again, which is kind of you think that the season lasts a little long, but you can't wait for it to go again. But it's not only the thought of a winning a Stanley Cup that drives Doan. It's not even game-winning goals or overtime victories that keep him coming to the rink. And it's apparent his teammates love him, too. During the past post-season, despite being unable to play, Doan wasn't a forgotten man. While he might be unwilling to admit it himself, Doan is a major part of a Phoenix team that appears to be, after years of hardship, on the rise.